Android smartphones are very useful with tons of merits. Good merits why I love the android smartphone is because of there multitasking purposes, ease of notifications, easy access of tons of applications, through the use of google playstore service, ability to install modified ROM, tons of lovely widgets, and also lot of google branded apps. The android smartphone has lot of extracool features, and that is the more reason is been known in the global market. Don’t forget that any thing that has merit also has its demerit. One uncool thing about android smartphones is that it seems to be somehow useless without internet connection, that is, it makes use of continous internet connection. Today’s stroll, I would brief you guys on the best way to turn off auto-update of applications in android phones. Auto update of application may seem so cool, that is, your application is always updated automatically, whenever there is a new version of it, but remember, it also leads to the drainage of your data plan due to the continous internet connection of your device as I stated above, and this also lead to the drainage of your smartphone battery. Of course, I made a post which states, “5 ways to extend the life span of your Android battery”. 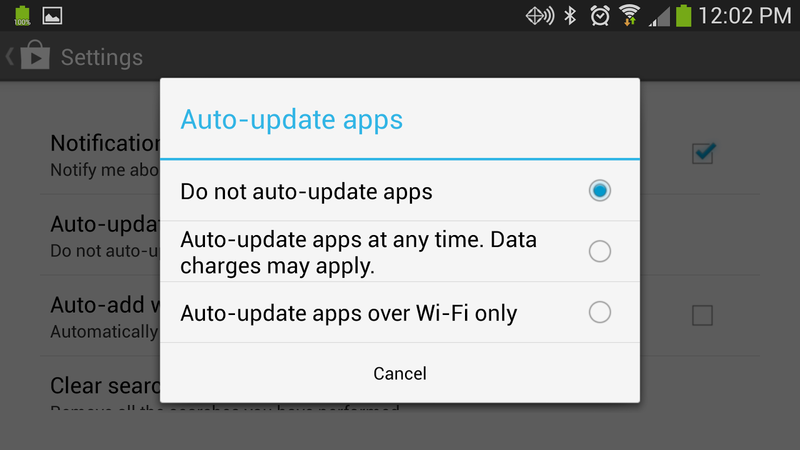 · Then select “Do not update apps”, or you can also select “Auto update apps over wifi only”. With the above procedure, you’ve successfully disabled the auto update of applications in your android phone. You can also disable auto update of your applications individually. To disable auto update of apps individually, simply move to your playstore >> menu >> my apps, then you would see the list of already installed apps in your smartphone, simply tap the app of your choice, then uncheck the “Auto update” box. Hope the above procedure helps? If you got any other related issue with your android smartphone, please do relate the problem to us, and we won’t hesitate to resolve such problem. Don’t forget to like our facebook page and also be part of our regurla email readers. You can take a stroll to our android section for more android tips.